Quote from a health care professional in our research project. This section aims to help you identify clients with poor health who could potentially be approaching end of life, or may benefit from palliative care. It introduces some tools and resources to help you explore signs, symptoms and concerns, and some red flags that may suggest a client is becoming more unwell. Many people experiencing homelessness have poor health and are at risk of dying young, on average around 30 years younger than for people who aren’t homeless. This is usually because homeless people often have complex needs, and are more likely to experience a combination of substance misuse, along with physical and mental health problems (tri-morbidity). They are also less likely to access healthcare until they are very sick. Some illnesses associated with substance misuse (such as liver disease from alcohol and/or hepatitis, and lung disease associated with smoking crack) can have an even more unpredictable course than illnesses such as cancer. It is often not clear how long a person with these illnesses might live, or when they might die, but we know that the quality and the length of their life will be reduced. Palliative care services are usually happy to support people with life-limiting illnesses, (such as liver or lung disease) so you do not need to know that a client has a terminal illness before approaching palliative services. It’s not always easy to know when someone might be approaching the end of life. The tools within this section might help you or health care professionals to consider whether clients may need additional support from health, social or palliative care services. You and your team are most likely to know a client well. Your knowledge and understanding of a client will be invaluable to other professionals to enable informed decisions about a client’s care, that are in line with their wishes. Always feel able to raise any concerns you have about a client’s health with members of the multi-agency team. Tools and resources for exploring your concerns with clients can be found in the communicating about what matters to clients section of this toolkit. These may be helpful in starting, and building conversations and will enable you to explore both clients’ concerns and your own. It is not always easy to determine if, or when, someone with advanced ill health is approaching the end of life. For the main types of illnesses that people may die from (cancer, organ failure, frailty), life expectancy can vary from person to person, even with the same illness. Also, predicting life expectancy (giving a prognosis) is difficult, even for healthcare professionals. Healthcare professionals will try to give the most accurate predictions they can, but this is an inexact science. A patient may die sooner, or survive longer than predicted. Information about prognosis is often used to help patients, families and health and social care professionals plan for and maximise quality of life and care for the patient. It is never too early to seek advice and support from health and social care professionals if concerned about a client’s health. The information in this section provides information about signs of deteriorating health, and how healthcare professionals identify people who may be approaching the end of their lives. The shared care section provides information about adopting a multi-agency response to the individual needs of clients once identified. The supporting client’s palliative and end of life care section provides information on the kinds of support available to clients’ and how to access them. Below are some red flags that may give an indication that a client is becoming more unwell and should trigger a discussion with the client’s health care provider. These signs may also point to other – possibly unrelated – illnesses, and do not on their own mean that a person is approaching the end of their life. * These signs and symptoms could be due to an acute treatable condition so it is always important to raise your observations or concerns with a health care professional. The Supportive and Palliative Care Indicator tool for all (SPICT-4ALL) provides more detailed information about the signs and symptoms that indicate a clients overall health may be declining. It’s has been designed with non-medical people in mind, (alongside the SPICT tool for health professionals), to ensure signs are recognised and talked about early so that better coordinated care and support is received, wherever a patient may be living. For the SPICT tool click here where you can register to be informed if the tool has been updated, or if new resources are added. The identifying clients of concern activity sheet can help you to consider any signs, symptoms and behavioural concerns you might have. The health monitoring tool can help you keep track of changes in a client’s health and healthcare. The SPICT- 4ALL tool can help you to recognise and talk about signs that a person’s overall health may be declining. This can help when exploring your concerns with the multi-agency team. If you are concerned about a client’s health, speak with the multidisciplinary team supporting you and the client as early as possible. A diagnosis normally refers to a particular illness or disorder that has been identified (e.g. a cancer diagnosis). A prognosis normally refers to the likely outcome of a disease and, in the case of terminal illnesses, will include an estimated length of time a person has left to live. Some people do not wish to be told this, and medical teams may underestimate or overestimate it. However it is a useful guide when planning the person’s care. A disease trajectory refers to the way in which a disease develops over time. It is often referred to as a person’s journey from diagnosis to death. See the Glossary for a full list of common terms used in palliative and end of life care. What tools are sometimes used to see if someone might benefit from palliative care? The tools below are sometimes used by clinicians to assess whether someone’s advancing ill health means they are approaching the end of life, or if they may benefit from palliative care input. This is known as the surprise question. If the answer to the question is ‘no’, I would not be surprised if this person were to die in the next 6 to 12 months’, health professionals might use this as a sign that they should consider talking to the patient, and those important to the patient (such as their friends, or their GP), about their wishes and needs towards the end of life. For many homeless people, clinicians and carers might answer with a ‘no’ simply based on the fact that any homeless person is already part of a high-risk population. A large number of homeless people die from accidents and overdoses, so a death within 12 months may not come as a surprise. Therefore, alongside the surprise question we need to consider other ways of understanding who, in the homeless population, might benefit from palliative care involvement. What are the trajectories of illnesses that are common among the homeless population? From each of the main types of illness that people may die from, (cancer, organ failure, and frailty) it’s possible to get some indication as to how a person’s illness trajectory is likely to progress. This can help to predict if or when they may be approaching the end stage of their life, and how to anticipate and plan their care along the way. All trajectory graphs are included with permission from RAND Corporation, Santa Monica, California, USA. The graph above represents a typical trajectory of an incurable cancer in which a person’s health is relatively stable for a period of time, often a few years.This stability may then be followed by a rapid decline.There are many reasons for this decline, including spread of the disease and loss of effect of active treatments, such as chemotherapy. People may also choose to stop treatment due to overwhelming side effects. Living with advanced cancer is normally perceived as a more predictable illness trajectory, with a greater likelihood of patients being supported to plan for and access end of life care services, compared with patients with other illness trajectories. Case study: What can happen after a cancer diagnosis? John was suffering from severe back pain and pain in his legs for a couple of months, but as he has a fear and distrust of medical services, he was reluctant to seek help. He was eventually admitted to hospital because he was in so much pain that he wasn’t able to move around easily. He was diagnosed with lung cancer, which had spread to his bones and liver. He was in a lot of pain because the cancer in his bones was affecting his backbone and pressing on his spinal cord. He was treated with radiotherapy but his pain was very difficult to control. Prior to admission John was finding it increasingly difficult to climb the stairs to his flat. He also needed support with cooking and shopping, but was fearful of losing his independence. He was concerned that there was no one nearby. Project staff were concerned they wouldn’t be able to support him there safely, as they were only staffed from 9 to 5, Monday to Friday and had very little support. However, soon after discharge John ended up back in hospital. His pain was difficult to manage, and he was struggling to pick up his methadone from the local pharmacy. John was concerned that his friends might use his opiate pain medication, which might cause him to start injecting heroin again. He wanted somewhere he could be looked after and supported. The medical team were persuaded by his keyworker not to discharge him back to his previous accommodation and it was decided that he needed sheltered accommodation. An application was made for a place in sheltered accommodation but this was rejected as he was an intravenous drug user (IVDU). An urgent multidisciplinary virtual meeting was held (i.e by email) which was coordinated by a healthcare professional with a particular interest in homelessness. This explored all options and prevented an unsafe discharge. John went into a hospice for a period of time to get his pain under control. A homelessness application was completed by his keyworker and John moved to another project, which was staffed for 24 hours a day and provided meals. His drug keyworker arranged with the local pharmacy to deliver his twice-weekly methadone and other medications in a locked box. John continues to be under the care of the palliative care team in the community and if his situation deteriorates, they will support applications for additional benefits and funding so that his needs are met in a timely way. As priorities and needs change, an early multi-agency response can help anticipate and plan for current and future eventualities. John’s keyworker was vital in ensuring his housing situation was considered. As there was good communication between hospital and community services prior to John’s initial discharge, every effort was made to support his return home – i.e. to the project at which he was residing before going into hospital. Although this did not work out initially, further multidisciplinary planning led to him residing in a more appropriate environment. Having specialist palliative care input, along with support from his GP and drug prescribing team, helped reassure staff at his new project of the kind of on going care and support John would be entitled to receive as his illness progressed. 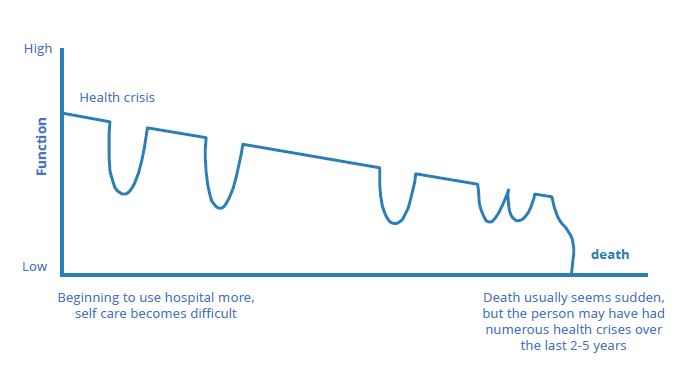 This graph represents the illness trajectory of people who may be elderly, frail or have dementia. This patient group often need community support over a longer period, as the progression of their illness can be more gradual and spread over a number of years. It also represents young people who may develop early onset dementia. Many homeless people who have been using substances for a number of years have a higher risk for their age (compared with the general population) of developing conditions including heart disease, lung disease, early onset dementia, cognitive impairment etc. Dementia at a relatively young age is not uncommon for people who have been heavy alcohol users for a long time. This is due to both a higher risk of traumatic brain injuries (from recurrent head injuries) as well as alcoholic related brain damage, due to Korsakoffs syndrome (a form of alcohol related dementia). Korsakoff’s dementia is a preventable consequence of untreated Wernicke’s encephalopathy. Wernicke’s encephalopathy is a result of vitamin B deficiency and usually develops suddenly, often after abrupt and untreated withdrawal from alcohol. It can present with a range of different symptoms including confusion, disorientation, memory loss, poor balance, or changes to the eyes or vision, hallucinations or unsteadiness. Wernicke encephalopathy is reversible with high doses of vitamin B so emergency referral to a healthcare provider is essential. If it goes untreated it can become Korsakoff’s syndrome which is irreversible. You may find this trajectory familiar if you’ve supported clients with advanced liver or kidney disease. Organ failure is characterised by periods where a person may feel quite well, followed by health crises where they will feel very unwell, perhaps for a few days or weeks, before their health begins to show signs of improving. A bit like a rollercoaster ride, Though a person may recover from a crisis, their health slowly declines over time. Each dip could be very serious and may need an emergency admission to hospital. The patient may die during one of these crises or may go on to recover. We can’t predict which crisis will end in death, though the likelihood of death increases as the frequency and /or severity of the crises increases. The final decline towards death can take as little as a few days, which can make it feel like a sudden death, though looking back at the person’s recent health, it may not be totally unexpected. This uncertainty makes planning for end of life care more difficult, (though not impossible). Late involvement of palliative care is a problem for many people with organ failure – not just homeless people. However people who are homeless may face additional challenges in accessing support. It is possible that a client with decompensated liver disease (see definition below), or advanced kidney disease, with recurring symptoms may not always be considered for palliative and end of life care support, at least not early on in the end stage of their disease, even though it is evident they are becoming more symptomatic, or have more frequent admissions to hospital. Many health professionals will consider liver disease a treatable illness, and see abstinence as a major factor in halting the disease, or if in an advanced stage, can slow it down to extend a person’s life. Without a multi-agency response early on within the end stage of a clients disease, particularly where there are concerns they will continue drinking, or poorly manage their hepatitis, opportunities for palliative care input will be missed. Joe is 46, has been homeless for over 10 years and has been living in a first stage project for 18 months. He is a long-term heavy drinker, diagnosed with decompensated end stage liver disease 12 months ago. Since this diagnosis, he has had a number of hospital admissions for gastrointestinal bleeding, alcohol related fits and ascites.The most recent admission was 4 weeks ago. Following each hospital discharge he resumes drinking, becoming verbally aggressive to staff if they try to engage him about the impact his continued drinking has on his condition. In recent months it’s become evident to staff that Joe’s health is beginning to deteriorate further. Concerned that Joe could die at some point in the near future, his keyworker arranged a case review at the project. He shared his concerns with Joe beforehand, and the reason for the review. Joe was fine with that and wanted to attend. The meeting was attended by a multiagency team, comprising Joe, his GP, the specialist homeless nurse and healthcare worker who visit the project twice weekly, and someone from addiction services. Everybody present expressed a wish to respect the choices Joe made, despite the concerns they had. Joe’s GP spoke to him again about living with a life-limiting illness and how that can be managed if he could slow down or stop drinking. Following the meeting Joe requested detox, and the opportunity to move away from the project, as the temptation to drink there was high. He agreed to engage with alcohol services and attend his next hospital appointment for a liver scan and blood tests. In the weeks that followed, Joe sporadically attended a few alcohol groups, until he claimed he had reduced his drinking and stopped attending the groups. He also claimed that, as he had done detox and rehab many years before, he knew everything they would say and didn’t need to keep attending the groups. Staff struggled to accept his wish not to continue engaging with the alcohol services, particularly as he had not recovered well from his last admission. The GP would speak to the liver team about a possible re-referral. As Joe’s care was shared across two hospitals a request was also made to transfer care to one hospital. A referral to palliative care would be made for symptom management and future care planning. Joe’s keyworker would initiate some conversations to see what matters to him at the moment. The homeless nurse would take on the role of coordinator to ensure everybody was kept informed of notable changes. The team would meet regularly, with email and telephone contact in between. The option for addiction services to support Joe would be left open. When Joe’s keyworker spoke to him, his only wish was to move to a bigger room so he could adequately store his clothes. An initial case review attended by Joe and professionals involved in Joe’s care helped to clarify the uncertainty around Joe’s condition and the potential of him dying. Joe heard that everybody wanted to respect his choices. At the next multi-agency meeting it was clear that Joe was struggling to engage with services, despite his best efforts. This meeting provided an opportunity to consider the potential for future treatment options (i.e. reconnecting with the liver team), and the need to plan ahead should Joe’s health deteriorate further. It also considered who else to involve in his care (i.e. specialist palliative care). With Joe’s request for a bigger room came the opportunity to focus on what really mattered to him, opening up the possibility of further conversations around his concerns and wishes. Priorities change, as do needs, so responding in this way meant Joe felt listened to and respected, which created an atmosphere of trust and the possibility of more open and honest communication. With regular multi-agency meetings, the team are more able to anticipate future eventualities (i.e. notable changes in Joe’s health) and adopt a parallel planning approach to care. And with more monitoring of these changes, opportunities for planned – as opposed to crisis – admissions to hospital are possible.This also includes the opportunity for Joe to be placed on the GP palliative care register, where his care needs will be regularly discussed. The multi-disciplinary approach (that includes palliative care), will continue to provide emotional support for Joe and the project staff as his health deteriorates. With the emphasis on what matters to Joe, his wishes and priorities will be discussed and included, helping to ensure he is well supported and cared for. It will also include planning for practical support to be provided within the project, such as personal care, medical equipment and additional funding (i.e. continuing healthcare), along with support from the palliative care team, bringing much needed relief to staff at the project. As liver disease is such a common illness – and cause of death – among clients, it can be useful to understand how it can develop. The liver map separates the progress of liver disease into three broad stages; pre cirrhosis, compensated cirrhosis and end stage liver disease and includes key indicators and possible responses. The aim of the liver map is to help you understand the stage at which a client is at with their liver disease, and act as a guide for when to consider particular conversations or interventions with clients and others. Throughout each stage there is a need to recognize the importance of multi-agency working, particularly in the middle and final stages.Without a multi-agency approach, opportunities to explore future possibilities with clients early in their trajectory might be missed. You will find a printable version of the liver map here. You may find it useful to display in a common area that you and your team meet. Cirrhosis, compensated and decompensated liver disease explained? Cirrhosis is a chronic disease of the liver marked by degeneration of cells, inflammation, and fibrous thickening of tissue. It is typically a result of alcohol dependency or hepatitis. Cirrhosis is divided into two stages: compensated and decompensated. Stage 1 – Compensated cirrhosis. This means that the body still functions fairly well despite scarring of the liver. Many people with compensated cirrhosis experience few or no symptoms. Stage 2 – Decompensated cirrhosis. This means that the severe scarring of the liver has damaged and disrupted essential body functions. Patients with decompensated cirrhosis develop many serious and life-threatening symptoms and complications. Internal bleeding from large blood vessels in the oesophagus, called bleeding varices. Yellowing of the eyes and skin, called jaundice. Sepsis, often due to infection of the ascites which leads to a rapid deterioration in health if untreated. The identifying clients of concern activity sheet, the liver map and SPICT-4 all tool can help you think about the signs and symptoms of deteriorating health and how the multi-agency team could respond. Talk with the multidisciplinary team, or a client’s GP early about any concerns..
As palliative care aims to support people with life-limiting illnesses, involving them early could help with such things as symptom management or psychological support. They can dip in and out as needed. The exploring the benefits of palliative care input activity sheet can help. Think about a parallel planning approach which allows for various options to be considered. Talking about options means clients have the chance to discuss what is important to them, and what they would like to see happen should their health deteriorate. This tool aims to help GPs, clinicians and other professionals in earlier identification of those adult patients nearing the end of their life who may need additional support. The Queens Nursing Institute Homeless Health Project have developed the following guidance for health care professionals supporting homeless people, which covers all aspects of health, not just palliative care.